2 TB LaCie Rugged USB-C [STFR1000800] - €149.00 : PrismaStore!, The source of Apple products. The LaCie Rugged® USB-C portable drive marries rugged durability with cutting- edge USB-C. The result is a vault for your data that’s compatible with next-gen computers like the Apple Macbook, as well as USB computers. Featuring the market’s highest storage capacity for its size, the LaCie Rugged USB-C gives you enough space to store your digital present—and future. Massive capacity lets you use the LaCie Rugged as a shuttle drive to transport footage from set to post-production or to store a huge Lightroom® library. 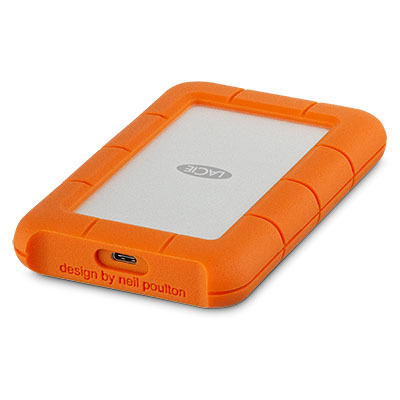 Creative pros have been depending on LaCie Rugged drives for over a decade because they are the most reliable way to transport and capture data in the field. With resistance to drops, crush, rain, and unauthorized access, the LaCie Rugged USB-C is tough enough for extreme conditions—from a sudden rainstorm to a crush of suitcases in an airplane cargo hold. 2 Determined by a test that approximates a real-world scenario in which the hard drive remained functional, despite aesthetic damage, after the product was driven over by an approximately 1-ton car (1000kg/2205 lbs).